The Scout dropsuit is a lightweight suit optimized for enhanced mobility, multi-spectrum stealth, and heightened awareness. Augmented joint servo motors give every movement extra speed and flexibility, while integrated friction and impact dampening materials reduce the overall sound signature. This high-tech suit is coated in adaptive camouflage, a thin layer of bio-hermetic membranes interwoven with microscopic optical sensors that control millions of individual pigment ferro-crystals. An integrated AI-53 All Eyes sensor system wraps around the inside of the helmet, which also includes a chemically scrubbed atmospheric filtration system. 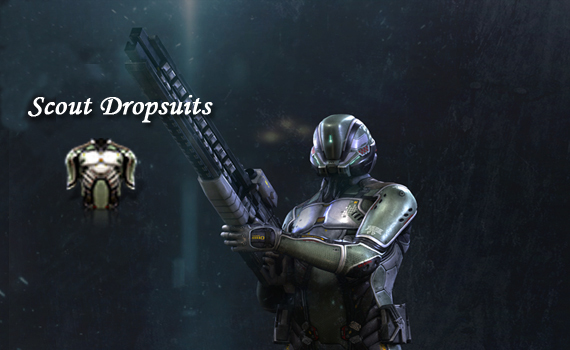 When missions call for speed and stealth, situations in which heavily armored suits would be more of a burden than an advantage, a scout dropsuit is the best option. The enhanced mobility it provides makes up for its relatively low protection, and when combined with stealth technology modules, the scout suit is the obvious choice for infiltration, counter-espionage, and assassination. Engineered using technology plundered from archeological sites during the UBX-CC conflict in YC113, the Dragonfly is a GATE suit designed to adapt and conform to an individual’s usage patterns, learning and eventually predicting actions before they occur, substantially increasing response times and maneuverability. I do not question. I do not hesitate. I am an agent of change, as immutable as time itself. Fate is my shadow and will, my weapon. And on this day as you stare into my eyes and plead for mercy, you will know my name. Last seen more than a hundred years ago, the Kindred were believed dead, but the emergence of their colors amongst the ranks of cloned soldiers has caused many to question those assumptions. Is it really them? Why have they returned? And most importantly, to what end? Regarded as one of the most outrageous promotional stunts in the company’s history, the Quafesuit has been called both genius and loathsome. Love it or hate it, none can deny its effectiveness as a marketing ploy, though many have questioned how the softdrink giant was able to procure a shipment of dropsuits in the first place.